For the raita, heat the oil in a frying pan over a medium-high heat and cook the spinach leaves briefly, turning constantly. Remove from the heat as soon as the leaves are bright green and wilted. Mix together the garlic, yoghurt and lemon juice and stir in the chickpeas and spinach. Set aside. 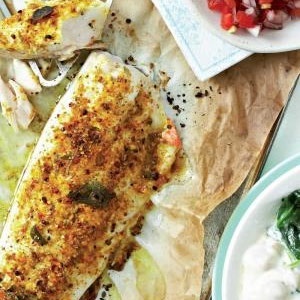 Open out the fish and place skinside down on an oiled baking sheet. Drizzle with a little oil and sprinkle generously with the curry spices. Grill for 6 to 8 minutes or until just cooked. Leave to rest for 5 minutes and then serve with the raita and tomato and onion sambal. Gurnard is a red-skinned fish on SASSI’s green list. Rather undercook than overcook the fish – it will continue cooking for a few minutes longer once you have removed it from the heat.